Please join us for a day of presentations, workshops, and performances that celebrate the contribution of art to social justice movements. This event is a unique way to build community and awaken our imaginations. Refreshments and dinner are provided! The event is FREE (registration appreciated), family-friendly, and open to all. Activist art is vital to the success of a movement. This presentation will highlight the art affinity group Voces de los Artistas that is part of Voces de la Frontera—Wisconsin’s leading immigrant rights group and low-wage workers center. Executive Director of Voces de la Frontera, Christine Neumann-Ortiz will discuss current Voces and YES! 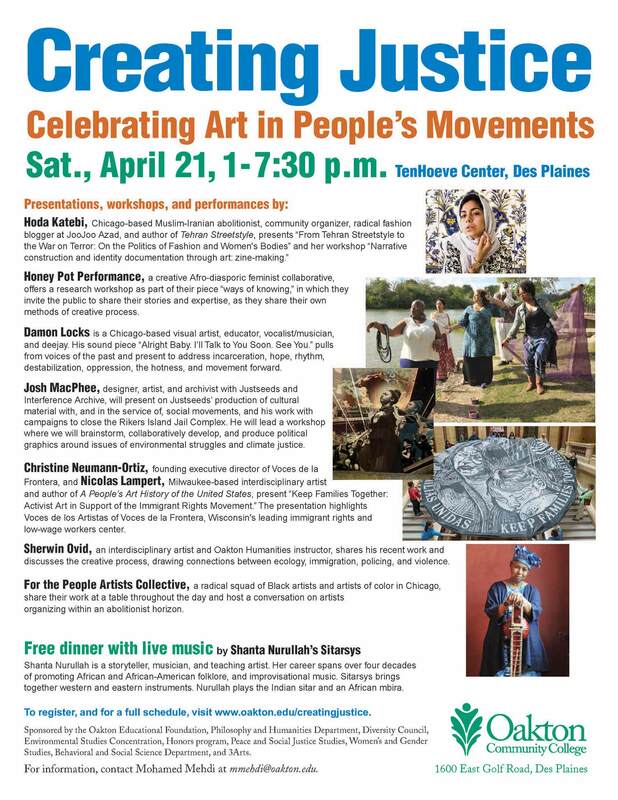 (Youth Empowered in the Struggle) campaigns and Nicolas Lampert, a Justseeds artist, will discuss examples of art in the movement. Besides being used as a measure of one’s clout, fashion is a powerful means of communication, oppression, and resistance. Between Kanye West’s refugee camp collection, and miniskirts being used as a sign of Afghanistan’s modernization, the way people choose to present their bodies for public consumption is more powerful than meets the eye. Starting with images of illegal fashion that she documented in her book, Tehran Streetstyle, Hoda Katebi will guide participants through an engaging conversation exploring the politics of fashion and what it reveals about contemporary structures of violence and modes of resistance. Pulling from voices of the past and present to address issues around, incarceration, hope, destabilization, rhythm, oppression, the hotness and movement forward, this piece is created using drum machines, sampler, boombox, synths, and other sound generators. MacPhee will discuss his practice and his collaborative work with the Justseeds Artists’ Cooperative. He will focus on Justseeds’ production of cultural material with and in the service of, social movements, and his activities working closely with New York City-based campaigns to close the Rikers Island Jail Complex and more broadly for pre-trial justice. Identity reclamation and documentation are central to JooJoo Azad’s mission to prevent your oppressors from telling your stories or teaching your histories. In this hands-on workshop, Katebi, a political fashion blogger, author, and community organizer, will guide participants through the process of creating zines, or DIY publications, and filling the pages with untold narratives, celebrations of self and community, and explorations of ideas that will document, uplift, celebrate, and teach others about your struggles, victories, and community. What do you know? How do you know it? How do you create value for what you know? This work in progress explores ideas about knowledge production, mastery, and value. We invite the public to share their stories of expertise with us as HPP shares our own creative process. We will gather to discuss the value of our various knowledge making tools and the skills we work to sharpen and refine through our respective practices. We will engage in an interactive sharing and a showing of the work in progress. Join us. Learn something new. Share your expertise. Be valued. Be present. Be in community. Gather, Seek, Show, Share, Nourish. How can an artist working in the studio engage pressing social concerns while generating imaginative possibilities? Ovid’s art making process is informed by overlapping concerns about ecology, immigration, policing, and violence. In this conversation, he shares recent work and discusses what the creative process of the studio artist can offer in drawing connections between these seemingly disparate issues. Brainstorm, collaboratively develop and produce political graphics around issues of environmental struggles and climate justice. –For the People Artists’ Collective states as their vision: “As artists, cultural workers, abolitionists, & organizers we are actively envisioning a world without prisons or police. Where a multitude of gender and expressions are valid and seen. Where all bodies are valued and celebrated as they are and as they change, regardless of color, size, age, health, and ability. A world where justice is transformative and not punitive. Where space to grow and heal is accessible. Where people can move freely or stay, where self-determination is respected and supported. Where radical love is abundant and centered in all of our actions. We have every intention to create collaborative art that works towards healing and strengthening a total transformation of the cultural landscape of our city and our world”. Members of For the People Artists Collective will screen a short film and discuss their recent exhibit, Do Not Resist! 100 Years of Chicago Police Violence as part of a conversation with other presenters on abolitionist art. ++For the People Artists Collective is a radical squad of Black artists and artists of color in Chicago. As artists who also organize, it is our duty to create work that uplifts and projects struggle, resistance, liberation, and survival within and for our marginalized communities and movements in our city and our world. In winter of 2018, a small team of artists within FTP curated DO NOT RESIST? 100 YEARS OF CHICAGO POLICE VIOLENCE, a community-based, artist-led visual project and exhibition. Members of FTP will be sharing their work and ideas at a table throughout the day at Creating Justice. ++Hoda Katebi is a Chicago-based Muslim-Iranian abolitionist, author, community organizer, and radical fashion blogger. She graduated from the University of Chicago in 2016 where her research focused on the politics of the underground fashion movement in Iran and the intersections of feminism, resistance, fashion, and nation-hood. In 2013 she started JooJoo Azad, a radical, anti-capitalist fashion blog that has been hailed from BBC to Mother Jones. In 2016 Hoda published the book Tehran Streetstyle, the first-ever in-print collection of streetstyle photography from Iran aimed to challenge both Western Orientalism and domestic Iranian mandatory dress codes. She is a member of the For the People Artist Collective and core organizer with Muslims Organize. Hoda’s work has been featured on various online, in-print, radio, and television media internationally. ++Nicolas Lampert is a Milwaukee-based interdisciplinary artist and author whose work focuses on themes of social justice and ecology. Collectively, he works with the Justseeds Artists’ Cooperative – a worker-owned printmaking cooperative of thirty artists in North America that formed in 2007. He also collaborates with Voces de los Artistas – an art-affinity group that is part of Voces de la Frontera. His first book A People’s Art History of the United States: 250 Years of Activist Art and Artists Working in Social Justice Movements was published by The New Press in 2013 and is part of the People’s History Series edited by Howard Zinn. Lampert is a full-time faculty member (academic staff appointment) in the Department of Art and Design at the University of Wisconsin-Milwaukee with a joint appointment in Printmaking and Writing and Critical Thinking. ++Josh MacPhee is a designer, artist, and archivist. He is a member of the Justseeds Artists’ Cooperative (Justseeds.org), the co-author of Signs of Change: Social Movement Cultures 1960s to Now, and co-editor of Signal: A Journal of International Political Graphics and Culture. He helps run Interference Archive, a public collection of cultural materials produced by social movements (InterferenceArchive.org). ++Christine Neumann-Ortiz is the founding Executive Director of Voces de la Frontera. Ms. Neumann-Ortiz is recognized as a national leader in the immigrant rights movement. In 2012, Ms. Neumann-Ortiz was named by The Huffington Post in its list of “50 Young Progressive Activists Who Are Changing America.” Ms. Neumann-Ortiz has received numerous awards including the Community Change Champion Award for Community Organizing and Leadership from The Center for Community Change and the Equal Justice Medal by Legal Aid Society of Milwaukee. Through her leadership, Voces has grown from a small, grassroots worker center to a state and national leader in the immigrant rights movement. In 2017 Voces successfully organized two statewide general strikes against 287g in Milwaukee County that resulted in blocking its implementation and the resignation of former Sheriff Clarke. In 2016, The Nation magazine awarded Voces for “Most Valuable Strategy” in honor of the February 18th Day without Latinos & Immigrants statewide general strike, which defeated a state anti-sanctuary bill. In 2012, The Nation named Voces the “Most Valuable Grassroots Organization” in the country. In 2009, the Wisconsin State Assembly recognized Voces for its role in achieving passage of in-state tuition rights for immigrant students as part of the 2009-2011 state budget. Ms. Neumann-Ortiz earned her Master’s Degree in US/ Chicano History at the University of Texas-Austin and her Bachelor of Art degree in English at the University of Wisconsin- Madison. ++Shanta Nurullah is a storyteller, musician, and teaching artist. Her career spans over four decades of promoting African and African-American folklore, spoken word performance, children’s and improvisational music. A member of the legendary Association for the Advancement of Creative Musicians (AACM), her current band, Sitarsys, recently released “Sitar Black”. Sitarsys brings together western and eastern instruments played by a stellar group of creative musicians. Ms. Nurullah plays the Indian sitar and an African mbira. Since its inception in December 2015, Sitarsys has performed around Chicago at Elastic Arts, the Washington Park Incubator Jazz series, the Artists of the Wall Festival, and Old Town School of Folk Music’s 77 Beats series. Shanta’s signature sitar style elicits the stomps, moans, and rhythms of blues and jazz, as well as the lyrical, dreamlike sounds most often associated with the sitar. Her unique approach has been heard over the years in Shanta’s work with the all women’s groups Sojourner, Samana, and Gemini, as well as bands led by Kelan Phil Cohran, Dee Alexander, Nicole Mitchell, David Boykin, Tomeka Reid, and Saalik Ziyad. In 2015 Shanta was a featured soloist in AACM 50th anniversary concerts at Chicago’s Mandel Hall, the DuSable Museum, and Millennium Park. ++Sherwin Ovid is an interdisciplinary artist born in Trinidad. He received a BFA from the School Art Institute of Chicago and was a Lincoln Fellow in 2013 at the University of Illinois at Chicago where he received his MFA. He currently teaches as an adjunct professor at Oakton Community College and Northwestern University. Ovid has exhibited at Randy Alexander Gallery, Goldfinch Projects, Gallery 400, University of Wisconsin, Cleve Carney Art Gallery, Haitian American Museum of Chicago and Iceberg Projects in Evanston. He was published in New American Painters in 2016 as a noteworthy feature. Sherwin maintains a multifaceted approach to sustaining socially engaged work both inside and outside of a studio practice, and some of the permeating ideas are on the process of migration and cultural transmission. Creating Justice 2018 is sponsored by the Oakton Educational Foundation and the Humanities and Philosophy Department. Additional support has been provided by the Honors Program, the Behavioral and Social Sciences Department, the Environmental Studies, Peace and Social Justice Studies, and Women’s and Gender Studies Concentrations, the Diversity Council, and 3Arts.